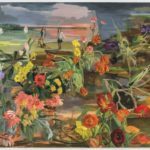 An innovative show at the Katonah Museum of Art juxtaposes modernist and contemporary landscape art. Marguerite Thompson Zorach, Moonlight, 1910, oil on panel, 16 x 12 3⁄4 in., Heckscher Museum of Art, Huntington, NY. Gift of the Baker/Pisano Collection. There are specific moments in art history at which new ideas seem to spring into life, creativity blossoms, and traditional ideas about representation recede into the background. 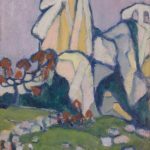 “LandEscape: New Visions of the American Landscape,” which opens at the Katonah Museum of Art in Katonah, N.Y., on March 17, examines the work of two of those moments: the Fauvist- and Expressionist-inspired landscape paintings of early 20th-century American modernists and paintings by contemporary artists who are reinventing the genre. By juxtaposing works from these two time periods, the exhibition spotlights the unique treatment that these very different artists have given what was, according to the Academies of Fine Art, one of the lower-ranked and more unexceptional genres of painting. Associate Curator Michele Wijegoonaratna, who assumed curation of the show after the original curator, Olga Dekalo, left the Katonah Museum, says that “LandEscape” highlights these two moments in time when artists “returned to the landscape.” And while the reasons behind that return may differ from artist to artist and time period to time period, they resulted in similarly creative—in some cases, revolutionary—approaches to a time-honored genre. While Hartley, Maurer, and their contemporaries took much from the Europeans’ approach to form, attitude toward light and color, and intensity of expression, they were hardly copyists. As Wijegoonaratna writes in her exhibition essay, “They also internalized their experience of European art, finding inspiration in the distinctive vernacular of the American geography and topography.” Hence pieces like Marguerite Thompson Zorach’s Man Among the Redwoods (1912). In this influential painting, Zorach uses the bold visual language of expressive line and heightened color, which she absorbed in her travels through France, to depict one of the most iconic American landscapes—the redwood forest. Similarly, Hartley’s Dogtown (1934) and Give Us This Day (1938) mingle a deep rootedness in a real American landscape with an expressive and—in the case of the latter painting—religious significance. Dogtown depicts the barren, inhospitable landscape of the abandoned colonial settlement of the same name, near Gloucester, Mass. The use of intense color and line plainly show the influence of Fauvism. 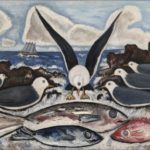 Give Us This Day, which shows seagulls gathered together over three fish, uses a much more subdued color palette; however, the intensity of expression and significance is conveyed through the bold lines and arresting position of the center seagull, which is spreading its wings in an almost angelic manner. This was one of a series of paintings by Hartley that depicted elements of the ocean as religious symbols. 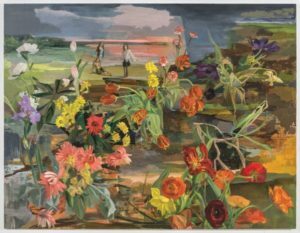 This idea of a fictional landscape, or a mindscape, creates an interesting bridge between the modernists of the early 20th century and contemporary landscape painters. 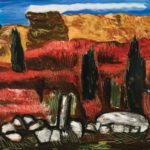 While many of the modernists were painting their landscapes from life, either en plein air or by doing sketches that they then brought back to their studios, there was still that highly imaginative element to their works. Landscapes were not depicted literally but were imbued with a greater emotional resonance through the use of various stylistic choices. 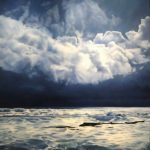 Richard Mayhew, an African-American and Native American 21st-century artist whose 2014 painting Pescadero is featured in the Katonah show, is one of these. Born in 1924, Mayhew lived and painted in New York during the 1950s, during the height of Abstract Expressionism. This period, as well as his studies of Impressionism in Europe, were highly influential on the artist, and helped develop the color-saturated, impressionistic landscapes he’s known for. These paintings are inspired by specific landscapes, but convey more the spirit of the place rather than its reality. Dodd’s painting Water Gap, Last Snowfall, March 2003 (2003) is one of the standout pieces of the show. The focal point of the piece isn’t the visual depiction of the winter landscape but the silence that pervades it. The muted palette of pinks, blues, and whites is applied thinly and with precision, while stark trees with crooked branches add to the sense of spareness and quiet.